Edgars Bebris (shooting) was Phantoms man of the match in MK. Peterborough Phantoms chief Slava Koulikov believes the English Premier League Cup final was settled by ‘one moment of skill’ last night (March 18). Unfortunately it came from Milton Keynes man Adam Carr and provided the most agonising of conclusions for the city side as they were pipped on sudden-death penalties. Phantoms’ 2-1 success in the first leg last Sunday was cancelled by a 3-0 triumph for Milton Keynes in the return clash. That set up a dramatic overtime shoot-out for the trophy, but neither side could find the net in five minutes of thrilling three-on-three action. And they continued to draw a blank when it came down to penalties with the first nine takers all failing to light the lamp - Petr Stepanek, Darius Pliskauskas, Ales Padelek, Wehebe Darge and Edgars Bebris the men frustrated by MK netminder Przemyslaw Odrobny. But Carr did finally succeed in beating Janis Auzins with Lightning’s fifth attempt to earn them the silverware and leave Phantoms having to settle for being runners-up for the second successive season. “I’m disappointed,” said coach Slava Koulikov. “I cannot pretend I feel any other way. To come so close to winning the trophy, but to miss out is tough. “I always hear people saying a penalty shoot-out is a lottery, but I don’t look at it like that. “I regard it as a one-on-one skill game and it only takes one moment of class to win it. “It went our way in the semi-final against Telford, but it was MK who provided it in the final. “I have to give credit to them as they were amazing at times, but I’m really proud of the way my guys performed across both legs. Phantoms conceded in all three periods of the second leg. Finnish star Antti Holli provided the first two Lightning goals before fellow import Frantisek Bakrlik struck. Bakrlik’s goal arrived in the final session at a time when Phantoms were bossing the contest. “We were dominant in the third period where we did everything but score,” added Koulikov. “We just couldn’t find a way to get the goal. Had we done that, I think we could have gone on to finish the game in 60 minutes. “But you don’t win a hockey game if you don’t score, and we didn’t manage to find the net all night. “I want to thank the fans for being behind us again. I hope they are not too disappointed about us missing out on the trophy. Phantoms certainly can’t afford to dwell on their cup final disappointment – they return to action tonight (March 19). 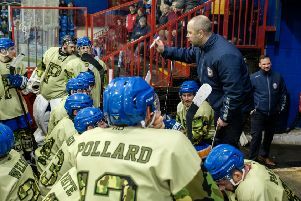 The city men entertain Guildford at Planet Ice (5.30pm) in their final outing of the regular EPL season. Phantoms dropped to fourth in the standings last night when Basingstoke triumphed in Swindon. They could reclaim third spot tonight if beating the Flames. “We go again tonight,” continued Koulikov. “It’s a new game on a new day, and we’ll do everything we can to finish the regular season on a high.